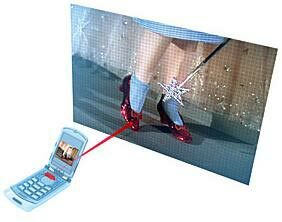 Microvision, a Redmond, Washington firm, plans to put a laser in your phone that can beam a 60-inch screen on a wall. The hard part is getting the right green laser to make it happen. Red lasers are in every CD player; blue lasers are used in Blu-Ray and HD DVD players but for years, no one has made comparable green lasers. Corning and Novalux are now developing miniature greens — freeing Microvision and its competitors, Texas Instruments and Britain-based Light Blue Optics, to move ahead. Microvision uses one continuously swiveling mirror to transmit a 30 megapixel/sec image. It requires less power and can be achieved with a projector small enough to fit into the back of an iPod. In July, the company signed an agreement with Motorola to incorporate its projector into a working mobile device. By Christmas 2008, Microvision hopes to sell a stand-alone, iPod-size microprojector as an accessory that can be plugged into a video iPod or cell phone. And by Christmas 2009, microprojectors could be built into the devices themselves. This guy Larry Winget has been appearing on CNBC’s Millionaire Inside programme and defies all conventions of the motivational guru, putting down all the usual positive-thinking, happy-talk as hogwash. 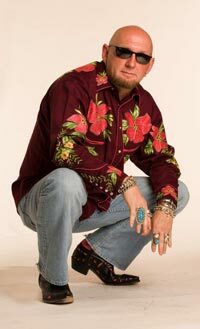 He is bald, sports a goatee, earrings, tattoos and wears colourful shirts and boots. He wrote two books It’s Called Work for a Reason! and Shut Up Stop Whining & Get a Life. Apparently, he was once a suited guy who use to spout the very guru-ish stuff he now ditches until he went to the desert and was struck by an epiphany. That’s pretty much contained in his manifesto at changethis.com. Get this: There are over 46,000 books that contain the word “team” or “teamwork.” All selling a load of crap. Teamwork doesn’t work. Yes, I know that is business blasphemy, but I am right and everyone else is wrong. Teamwork doesn’t work. And the reason is because someone on the team won’t work—which means you no longer have a team. You have a few good people who have to pick up the slack for the bozo that isn’t doing her share. They are frankly pissed off about it too. Because they know, at the end of the project, they will have to share the credit with her because after all, she is on the team. Stupid. Stupid. Stupid. Again. There are simply no secrets. When you see the word “secret” you should run! And when you hear that someone has a brand new concept for how to be successful, beware. You don’t need anything brand new; you need to go back to the old and simple stuff that makes sense. The world doesn’t want to change or it already would have changed all on its own and without any help from me. People change their lives when they want to, not because I want them to. 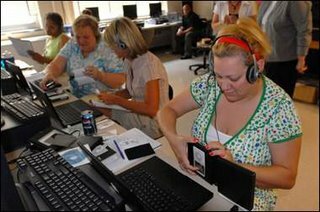 A consortium of Delaware school districts won a US$400,000 federal grant that was used to train teachers to produce and use podcasts as a learning tool for their students. That is why teachers — some of them self-confessed technology neophytes — are willing to give up a piece of their summertime to learn how to learn to bring the medium into the classroom for teaching purposes. “Technology is here, it’s here to stay, and it’s just a case of bringing technology up to where they are,” language arts teacher Brian Conway said, referring to his seventh-grade students at Meredith Middle School. iPods make podcasts portable, allowing the lessons to travel with students. “You can go on vacation with your family, and on the plane cover all the assignments you are missing,” Karen Hartschuh, an instructional technology specialist at Appoquinimink. And in the classroom, as students create their own podcasts, the assignments become more important to them, Hartschuh said, because their Internet audience is global, rather than the 20 or 30 people who normally might see it in a classroom. Podcasting also opens up doors that might be locked to a variety of other teaching methods, offering new avenues of instruction to students who learn more easily through visual or auditory mediums, she said. With podcasting, she said, students also learn something about reading and writing along the way, because they have to draft a plan and research text to create a podcast. The technology is catching on fast in schools, said Christine Dowd, another former teacher and an education development executive with Apple who also travels with the institute. She has helped train more than 500 teachers at about 30 schools in a little less than a year. To be sure, not everyone is embracing podcasts. Tom Harrison, 52, a Meredith Middle teacher, has yet to use podcasting in his classroom, but looks forward to introducing it to his seventh-grade science students.